Home » Blog » Family exercise time! Family time doesn't have to mean TV! For families with busy schedules, it may be difficult to find the time necessary to lead a well-balanced life. Exercise reduces stress, lowers the risk of heart disease, prevents weight gain and improves your mood. Biking: Bike to school, to the park or just explore your neighborhood! If your family doesn’t own bikes, they can be rented by the hour at some bike shops. Yard work: Turn leaf raking or snow shoveling into a fun activity instead of a chore. Make piles of leaves or snow and jump in! Gardening is also a great educational opportunity — plant a tree to teach your kids about the environment, or start a vegetable garden to encourage healthy eating. Sports: Some sports, like Frisbee, soccer or basketball, can be played easily at home. In the summer, take your kids to the community pool, and in the winter, to the skating rink. Park day: Invite other parents and their kids to a picnic at the park. Organize a game of flag football or kickball, or set up activities like a water balloon toss with prizes for the winners. This is a full day of outdoor fun for kids and parents! 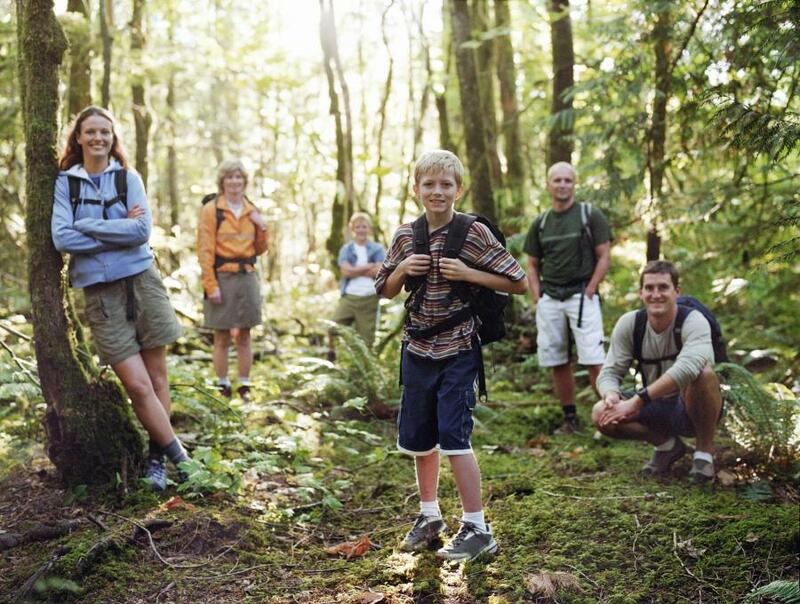 Walking/hiking: If the weather is nice, take your family to a nature park with hiking trails. If you’re pressed for time, go for a 20 minute walk around your neighborhood after dinner. This is also a great way to facilitate interaction and communication between members of your family. Yoga: Look up instructional yoga videos online and follow along! Yoga reduces and stress and improves both physical and mental health, and it provides a great opportunity to roll around on the floor and act silly with your kids! Simple yoga moves can be done by people of all fitness levels. Follow these tips to encourage a more active lifestyle for your family!